Archeologists from all over the world work hard, and often under extreme conditions, to give us glimpses of history, but most of all, to delight our imagination. But unfortunately, many archeological discoveries all over the world have been considerably degraded and eroded by time leaving out many clues that can help an Archeologists paint pictures of the past. But every once in a while, archeologists hit the jackpot and uncover artifacts and objects that are reasonably or wholly intact. Let us begin our list of well preserved archeological finds with one of history’s biggest and most perplexing mysteries, the Voynich manuscript. The Voynich manuscript is an illustrated book, of unknown origin, written by an anonymous author in an unidentified alphabet and incomprehensible language. Although an exact date for its authorship has not been identified, Carbon-14 dating has placed the creation of the book sometime between the years 1404 and 1438. The manuscript has been the object of intense studies by both professional and amateur cryptographers but, to date, none have managed to decipher a single word. The Voynich manuscript is considered the Holy Grail of historical cryptography. Speaking of Holy Grails, the next item on our list is a hoard of ancient gold! In July of 2009, an English treasure hunting enthusiast, using only a standard metal detector, found the largest known Anglo-Saxon treasure trove to date. The treasure, known as the Staffordshire Hoard, consists of more than 7000 pristine pieces of gold, silver, and garnet jewelry, and is valued to be worth more than 3 million pounds sterling. The hoard, although, was deposited sometime during the 7th century, most items found were well preserved. And because of the exceptionally well-preserved status of the majority of items in the collection, the hoard provides unprecedented value and excitement to historians and is expected to alter our perception of Anglo-Saxon history radically. The next archeological discovery goes back about 500 years in history to the dawn of the new millennium; here, another example of an archeological discovery is generating profound insight and widespread excitement because it altered previously held notions of historical events. The ancient Roman city of Herculaneum, located in the Campania region of southern Italy was smaller than neighboring Pompeii and closer to Mount Vesuvius, such that when Mount Vesuvius erupted in the year 79 AD, Herculaneum, being much closer to the volcano became completely covered in a deep pyroclastic runoff. The layers of pyroclastic ash, as thick as 50 feet in some places, covered every surface of the city and preserved it to this day. Remarkably, the grand majority of the buildings still possess intact roofs, doors, beds, and even calcified food. Few ancient cities can match Herculaneum’s state of preservation, and it now stands as one of UNESCO’s World Heritage Sites. If the stones of Herculaneum survived the scorching heat of Mount Vesuvius’ fires, it is no wonder that the next stone in our list, untouched by fire, survived intact through the years. The Rosetta stone is an intact fragment of an ancient Egyptian stele of granodiorite stone that was inscribed with a royal decree and published in the ancient city of Memphis in the year 196 BC. The decree, written in the name of the Egyptian Pharaoh Ptolemy V, was inscribed in three distinct languages: Ancient hieroglyphs, Egyptian demotic script, and in ancient Greek. The fact that the stone was inscribed with the same message in three languages and with minimal variation in content provided archeologists with the highly-sought linguistic key that allowed for the deciphering of Egyptian hieroglyphs. Had the stone been lost to history, or found in a higher degree of deterioration, the world would still be blind to the wonders of mysterious ancient Egypt. Just as the Rosetta stone provided us with deep insight into the minds of ancient Egyptians, the next item on our list provided archeologists with profound knowledge of ancient China. China’s famed Terracotta Army is composed of more than 8,000 life-size statues of warriors and warhorses depicting the armies of China’s first emperor Qin Shi Huang. The legendary emperor was buried with this army sometime around the year 210 BC. Qin Shi Huang wanted to continue to have troops under his command even after death, and by burying the statues with him he believed they would offer him protection for all eternity. The terracotta army was buried in battle formation, in three trenches, barely one and a half kilometers east of the emperor’s tomb. Remarkably, each of these statues has unique facial features and characteristics, including different mustaches and hairstyles. Each soldier carried different weapons such as bows, spears, and swords. They even went so far to include soldiers of different ethnicities and age groups. The impressive stone army, which was discovered in March 1974 near Shaanxi Province in the People’s Republic of China, has given archaeologists, from around the world, an unprecedented glimpse into the practices of an ancient and proud culture. The very same can be said for the next discovery, the Tomb of the Athlete. An exceptionally intact tomb, dubbed the Tomb of the Athlete, was found in virtually the same condition it was left in some 2300 years ago in the outskirts of ancient Rome. Inside the tomb four skeletons, three belonging to males and one to a female were found wrapped in ceremonial regalia. Also found inside the tomb were splendid works of painted ceramic, most of them decorated with intricate motifs and geometric patterns, bronze coins, as well as plates of rabbit, chicken, and goat meat. Other items that were discovered accompanying the deceased were two iron strigils instruments used by ancient Roman athletes during their training. All the archaeologists involved in the discovery have expressed marvel at the fact that the tomb is so well preserved because it lies relatively close to the surface, barely two meters below ground in some areas. About the same time as these athletes were being buried near Rome, hundreds of ancient Hebrew Scriptures were being hidden in caves near the Dead Sea. The Dead Sea Scrolls, also known as the Scrolls of Qumran, so named for their discovery within the caverns and caves located in Qumran, on the shores of the Dead Sea, corresponding to the oldest and most complete testimony of biblical texts found to date. There a total of 972 manuscripts and most of them date back to a period between the years 250 BC and 66 AD, before the destruction of the second Temple of Jerusalem by the Romans a few years later. Most of the manuscripts are written in Hebrew and ancient Aramaic, with only a few of them being written in Greek. While very many of the manuscripts have been found intact, several were torn into fragments when first discovered to increase the profits from their sales. Speaking of the Hebrew culture, archeologists also relatively recently found 2000-year-old wine jars in Israel? Israeli archaeologists recently found two 2,000-year-old wine amphorae in a cave high in the mountainous region north of the country. The archeological dig also found several jars, bowls, and cooking pots made of clay. However, it is the wine amphorae that steal the show by virtue of their size. These wine jars measure over 27 inches tall and have a diameter of over 19 inches. Most remarkable is the fact that the site is located in an extremely difficult to reach cave which begs the question, why did they choose to settle there? The fact that cooking utensils were found suggests that people resided in the cave, at least for a while. Some archeologists also suggest that perhaps the cave previously enjoyed access that today no longer exists. If you think clay pots surviving for thousands of years is intriguing, then what how about an almost intact ancient ship found at the bottom of the sea. An international group of archeologists has found one of history’s most interesting finds. An intact sunken shipwreck found along known ancient Greek commercial routes, in the black sea, has been found after some 2400 years. The Greek ship, which was located off the coast of present-day Bulgaria, is so well preserved that its mast, oars, and rudders are still attached and even seem functional. This truly fascinating discovery could offer clues in shipbuilding and faring during ancient times. Another interesting discovery by a team of German archeologists is the discovery of the tomb of princess Herbertingen. Near the German town of Heuneburg, a group of archaeologists has discovered the burial chamber of a legendary Celtic princess. The cabin, which measures 20 meters square, is located in the center of a large mound which protected it from grave robbers to this day. After the first inspections, it was determined that conventional excavation methods would not be used since the chamber was preserved so highly. Therefore, the archeologists, in a marvel of engineering, extracted the entire chamber in one giant block of earth and transported it to a laboratory for proper analysis. What they found was astonishing. The oak wood of the chamber’s floor was intact and had not suffered any water damage as is so prevalent in underground tombs. Further study determined the tomb dates back to the year 583 BC, which gives the modern world a wholly unique view of the primitive and legendary Celtic world. The next discovery may broaden your horizon when you discover that the ancient Egyptians were not the only culture to mummify their dead. Throughout history, ancient cultures have assigned great importance to the preservation of their deceased as part of ceremonial funeral customs. While ancient Egyptian culture is the best-known example of this behavior, they are far from being the only one. One culture that regularly performed these rituals of mummification was the Peruvian Ichma people. Recently, it was announced that a team of archaeologists from Belgium had discovered an intact Peruvian mummy thought to be more than a thousand years old. Finding mummies is in itself rare, but finding specimens in such a pristine and untouched condition is a one in a lifetime find. 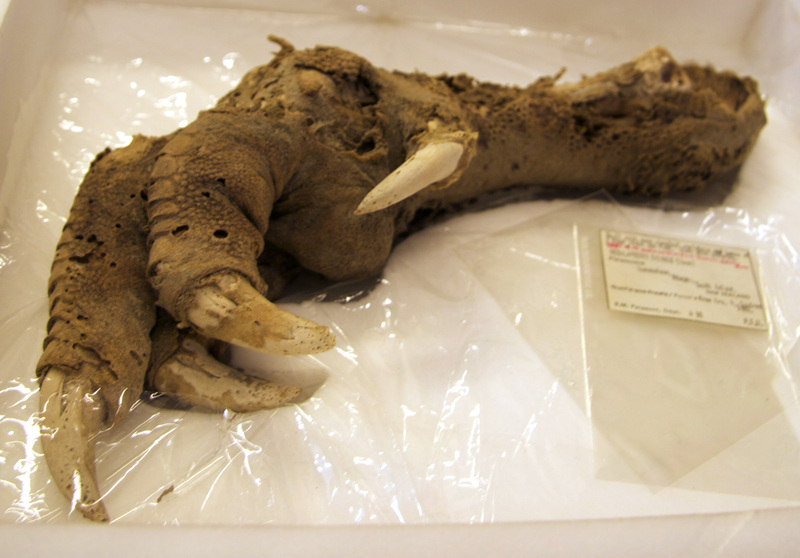 If you think mummies are fascinating, wait until you hear about the mummified claw that scared archaeologists in New Zealand. Everyone has heard of the Dodo; however, few people are aware of the existence of the majestic Moa. The Moa was a group of species of giant flightless birds, not unlike modern-day ostriches, which were native to New Zealand until their extinction around the year 1300 AD. However, thirty years ago, in 1986, a group of speleologists who were investigating a vast system of caves in Mount Owen, New Zealand, found a large and practically intact Moa talon. Its appearance (still possessing both muscle and sinew tissues) seemed to indicate that it belonged to a recently deceased animal. Nevertheless, laboratory analysis dated the find to be more than 3000 years old, which completely changed the world’s understanding of the way animal matter could decompose over time. The claw of Mount Owen was discussed around the world because for years many believed it to be the claw of a dinosaur. Another discovery that is probably commonly heard of around the world is the next item on our list, the tomb of the most famous pharaoh in history. The British archaeologist Howard Carter discovered the tomb of Tutankhamun in the Valley of Kings on November 4, 1922, near the tomb of Ramses VI. The site was found under the remains of the homes of the workers of the Ramesside period which helped to preserve it. Curiously enough, when Carter entered the chamber, he was able to photograph floral offerings that later disintegrated into dust after 3300 years. The tomb’s four chambers were replete with objects, so many, in fact, that completely emptying the tomb took over 8 years. More than 5000 pieces, including that pharaoh’s iconic mask, were eventually transported to the Egyptian Museum in Cairo. The fantastic discovery of King Tut’s tomb renewed worldwide interest in the study of Egyptology and inspired a generation of children to study archeology. Another important, albeit lesser known, tomb in Egypt was found deep within the necropolis at Qubbet el-Hawa, and it is the next discovery on our list. Qubbet el-Hawa, which is Arabic for House of the winds, is also known as the Valley of the Princes. The necropolis at Qubbet el-Hawa is located on a rocky hill on the western bank of the Nile and served as the burial grounds of the region’s highest dignitaries. A team of archeologists has recently found an intact mummy, identified as Shemai, which belonged to the brother of a prominent and well-known governor of the island of Elephantine some 3800 years ago. Besides the well-preserved mummy, the discovery is noteworthy as well for the fact that archeologists, for the first time, were able to document the entirety of one of the multiple burial chambers found on the island. The discovery of Shemai illuminates the genealogy of a lineage that for centuries served as royal emissaries during the military campaigns of the Egyptian Pharaohs. The next item on the list and perhaps the most amazing discovery in the history of archaeology may well shine a light on the lineage of all mankind! It is one thing for an inorganic matter like stone and masonry to survive intact throughout the years, but it is another matter when organic materials do so. Human remains enduring for hundreds of years, although not unheard of, is extremely rare; but for human remains to survive, well-preserved, for thousands of years is astonishing. In 1996, two archeologists digging through the peat bottom of a lake in the state of Florida, USA, found not one, but two intact human brains. The specimens were so well-preserved that they retained their original shape and size, and a laboratory analysis reported that the tissue contained intact DNA. Archeology can give glimpses into the deep past and may perhaps provide us with the insight to make accurate conjectures about the human future path through history. 6 Recent Health Contradictions That Would Make Your Head Spin! Are There Scarier Sides To Global Warming Based On Recent Findings?